The Blackwall Ironworks manufacture marine engines and giant boilers for mercantile vessels. 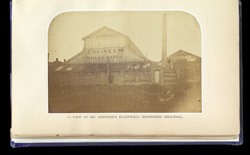 The engine and boiler works are situated on the Isle of Dogs, London. These incorporate fitting and erecting shops, a pattern shop, blacksmiths' and coppersmiths' shops, all designed by Mr Stewart for the manufacture of steam engines.